With such a long, rich and storied history, much of it documented through beautifully preserved homes, museums, historic squares, forts and cemeteries, Savannah offers multiple ways to experiences its preserved treasures. 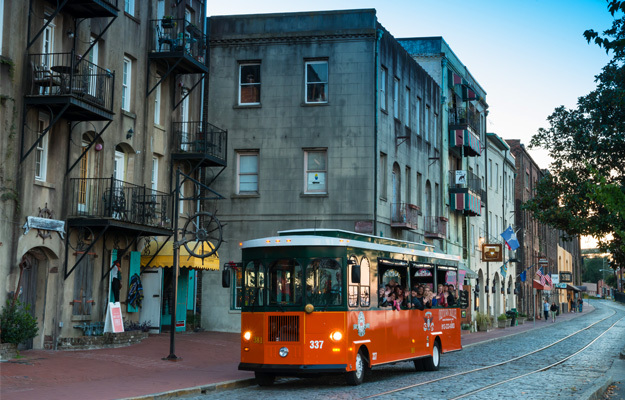 For the best overview of historic Savannah, Old Town Trolley Tours is just the ticket. 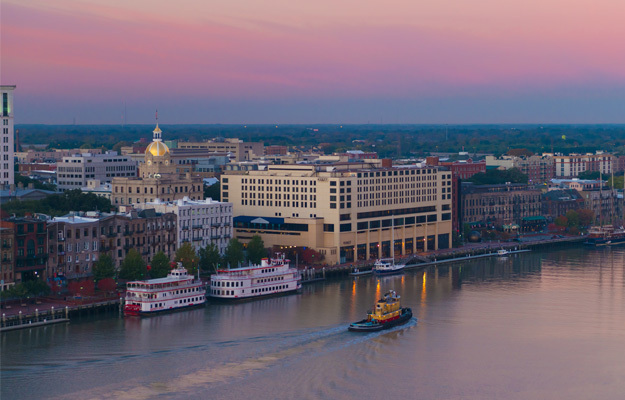 The 90-minute tour covers all the highlights and passes by must see places like the squares, historic houses, the riverfront, various Savannah museums and more. The tour conductors are not only knowledgeable, they’re entertaining too! By the time the tour is over, Savannah’s rich and intriguing history not only comes to life, but the layout of the city begins to make sense. Old Town Trolley offers all day hop off/hop on privileges too. This means you can hop off at any of the 16 conveniently located stops along the tour, explore the area at your leisure, and hop back on when you’re ready to board and resume the tour. At each stop, there’s an orange and green trolley stopping every 20 minutes, so there’s never a long wait. Old Town Trolley also has a 2-day pass, and the second day can be used any day, not just the next consecutive day! Most first-time visitors to Savannah want to see and learn about this historic city with a distinct southern charm, but not everyone wants to sit on a tour vehicle. There is a way to tour historic Savannah in an active way. See it on a Segway! Savannah by Segway makes sightseeing a super fun adventure. After a training session on the easy-to-use upright Segway’s requiring little effort on your part, secure your helmet, which they provide, and glide through the historic district, around the squares, past the house museums, statutes and countless other places of interest. The one-hour guided adventure gets you really close to all the places you came to Savannah to experience. It’s great for families with kids 15 years and older. You won’t hear “Are we done yet?” and they will want to come back for more! Another close-up way to experience historic Savannah is to walk through it. Walking tours are popular in the city, and there are plenty of choices. Most walking tours keep the groups smaller, taking reservations rather than operate with a regular schedule, and many are conducted by long-time residents with a passion for their community. The Explore Savannah walking tour schedules private tours and offers a variety of tour choices and lengths. 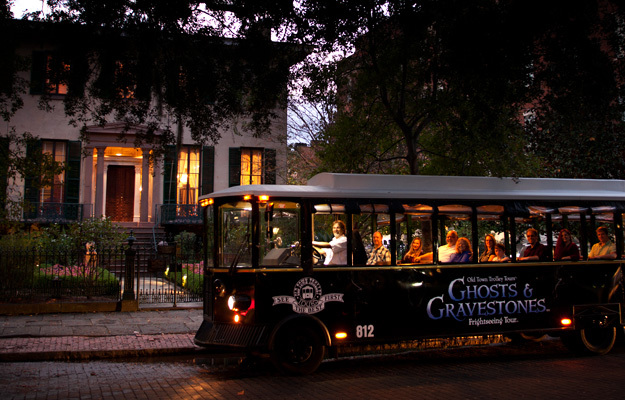 Just pick a tour that interests you: Savannah, Churches & Cemeteries, and more! The Savannah Dan offers a glimpse into historic Savannah on daily walking tours at specific times. He covers it all in great detail, and has a carriage tour for 4 option too. Savannah Heritage Tours also has a personal approach to their Historic District Tour, and can combine that tour with a tour of Bonaventure Cemetery. Cool Savannah accommodates larger groups on their regularly scheduled History and Architecture walking tour, which weaves history and architectural elements together. For visitors who want to focus on the details of Savannah’s architectural gems, Architectural Tours of Savannah does just that. The tour guide, an architect and expert in the city’s architectural history, leads one tour per day. Lasting 90-minutes, these tours are a narrative timeline starting with the oldest building, going through the major period and style changes and ending in the present day. Along the tour, a variety of buildings are examined and discussed. Architectural styles representing Savannah’s 300 year history range from Georgian, Federal, Regency, Greek Revival, Italianate, Second Empire, Gothic Revival, Romanesque Revival, Queen Anne and on to Art Deco and Contemporary. Another unique way to experience historic Savannah is through its African American history, which includes its Gullah/Geeche culture. Day Clean Journeys, whose name “Day Clean” translates into “New Day” or “Dawn’ in Gullah, offers several fascinating tours led by guide Amir Jamal Toure. Besides a Gullah/Geeche tour, Day Clean offers I love Savannah, African-American History, and Drums n Spirits tours. Significant sites are visited on each tour, including First African Baptist Church, secret schools and Underground Railroad locations. The evening tour, Drums n Spirits, explores folklore, history and the culture of the supernatural. In Savannah, history, culture and food intersect, making it possible to eat your way through history. Savannah Taste Experience has two tasty and super fun tour experiences. Sample delicious food at seven unique food spots surrounding the first of Savannah’s famous squares on The First Squares Food Tour. Woven into the tastings are stories of the city’s unique history and culture to show how both shaped Savannah’s palette. The Famous & Secret East Side Food Tour is an off-the-beaten-path tasting tour experience. How fun it is to gain exclusive entrance into a restaurant before it opens to the public to enjoy bites not even on the menu! Imagine enjoying award-winning food without having to stand in line and hearing the insider scoop of Savannah’s culinary world. The tour goes through residential areas of the historic district to reveal secret places with great tastes, which many locals may not know about. Savannah Foody Tours is another way to experience the South’s rich culinary history, as well as Savannah’s distinctive cuisine, all in the comfort of a motor coach. 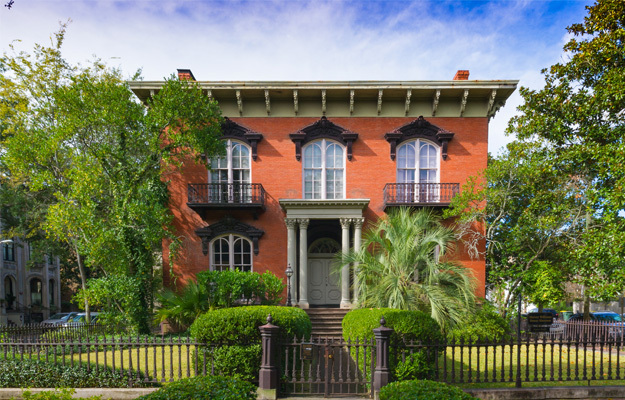 Historic house tours are popular ways to experience historic Savannah. Partners in Preservation is a package of admission tickets to three gems, and the selection will please everyone in the family. First up is the beautifully restored Isaiah Davenport House. It’s an early Federal-style house built in 1820 by Davenport himself. As a master builder, his attention to every detail created an architectural masterpiece. A soaring elliptical staircase, ornate plaster and wood work and furnishings throughout the home are all representatives of this time in the fledgling nation’s history. Then, the Andrew Low House, which is made of stucco over brick and is located on Lafayette Square. The house was built in 1848 for Andrew Low, a wealthy cotton merchant from Scotland. The tour of the interior offers a glimpse into the elegant lifestyle of affluent Savannah when cotton was king. The third house is the oldest example of domestic Greek Revival architecture in the South, the Scarbrough House. It was built in 1818 and is known to have the perfect setting for Ships of the Sea Museum, which tells the story of Savannah’s important maritime history through exhibits of ship models and nautical artifacts. Old cities like Savannah have a darker ghostly side too, born of legends and lore surrounding tragedies and death under mysterious circumstances. Historic Savannah is so filled with unseen spirits and paranormal activity that it has been designated America’s Most Haunted City. A Ghosts & Gravestones Tour is sure to show you why. As the black Trolley of the Doomed makes its way around dark streets and dimly lit moss-draped squares, shadows begin to play tricks on the mind as your creepy Ghost Host will tell tales of hauntings and sightings in places where they actually happened. See if you can feel the chill of a paranormal presence inside the two stops along the tour, the haunted Andrew Low House and the Perkins & Son’s Ship Chandlery. There is no telling what is lurking inside! Tour the harbor on a Savannah Riverboat Cruise, a triple-decker, stern-wheel, climate controlled vessel. The selection of river cruises includes a narrated sightseeing tour as well as lunch, brunch and dinner cruises. The Savannah River Cruise explores the Savannah River and the harbor area, from Fort Jackson to the Savannah Refuge. For a great day trip, the Savannah River, Intercoastal Waterway, Thunderbolt and Skidway River Tour is 3-4 hours of discovery into both nature and history. From Fort Jackson to Bonaventure Cemetery, perched on a bluff on the Wilmington River, to Thunderbolt, it really is a historical view you won’t want to miss. For a close-to nature treat, hop on one of Bull River Cruises open-air vessels. Explore the estuaries weaving through the tidal creeks and rivers through the salt marshes down to the barrier islands. The narrated cruise combines ecology and history as dolphins play and egrets stalk oyster beds. In their silence, Savannah’s historic forts are visual displays of the city’s history and are fascinating to visit. Explore Old Fort Jackson, Georgia’s oldest standing brick fortification, whose construction began in 1808 and was manned during the war of 1812. Fort Pulaski, located on Cockspur Island between Savannah and Tybee Island,was at the center of military science and invention. For much of the 19th century, masonry fortifications were constructed as the country’s main defense against attacks by sea. However, the Civil War accelerated wartime technology, making these forts obsolete. During the siege of Savannah, the Union army used the newly invented rifled cannon to force the Confederate garrison inside the fort to surrender.